Flyers center Jori Lehtera skates against the Boston Bruins in a preseason game. Flyers forward Jori Lehtera was charged Monday with buying drugs from a large cocaine distribution ring in his native Finland. 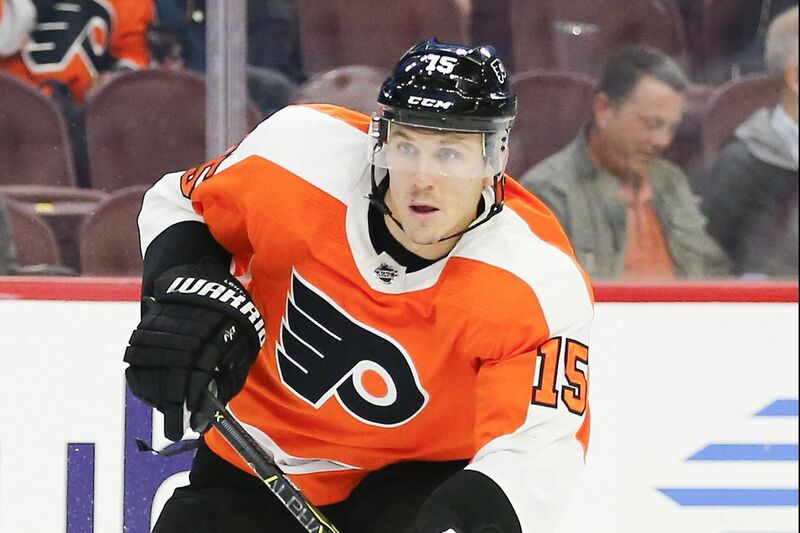 Lehtera, 31, is accused of purchasing eight grams of cocaine in June and July, in nightclubs in the town of Tampere, according to Finnish news reports. Prosecutors are seeking a five-month sentence. Lehtera, one of 22 defendants in the case, told police that he knows two of the other men charged but denied buying drugs from them. He said he once paid 6,000 Euros for one of the men to attend drug rehab. The trial, which started Monday, is expected to last six days, the Finnish newspaper Aamulehti reported. District court judge Petteri Kosonen told Iltalehti, another paper, that it is unclear whether Lehtera will appear in court or be represented by his lawyer. Kosonen also said it is possible Lehtera’s case could be split from the others and handled at another time. After practice in Raleigh, N.C., on Monday morning, where the Flyers played the Carolina Hurricanes on New Year’s Eve, Lehtera said he would fight the charges. A spokesperson for the Flyers declined to comment. NHL Deputy Commissioner Bill Daly said in an email that Lehtera had yet to be legally served. He said Lehtera plans to contest the charges. “As a result, we will not be intervening at this point and will continue to monitor the legal proceedings,” Daly said. Lehtera, who will become an unrestricted free agent after the season, has not played for the last six games and was not in the lineup Monday night. The Flyers have said he is not injured, but Lehtera has played in only 24 games this season. He has a goal and two assists. Lehtera played professionally for eight seasons in Finland and Russia before joining the NHL with St. Louis in 2014. The Flyers acquired him from St. Louis in the summer of 2017. He had three goals and eight points in 62 games last season. The case against Lehtera first made headlines in Finland in the fall, but the details of the investigation did not become public until Monday. In Finland, police records are often not released until the first day of a trial. Other defendants in the case, some who could face up to 10 years in prison, are charged with bringing drugs into the country and selling them. In total, the ring is accused of moving more than 1.8 kilos of cocaine in the Tampere region, according to court records. Some of the drugs were allegedly stashed in the locker room of a public sauna, Aamulehti reported. Lehtera has a vacation cottage in the area, and two of the suspects were taken into custody at the home in August, the Finnish television station MTV3 reported in September. One of the main suspects told police that he sold Lehtera cocaine, totaling eight grams, over several separate occasions this summer, according to police documents. As part of the investigation, police recorded phone calls between Lehtera and another suspect. Urheilu reported that police questioned Lehtera twice, in August in Finland and in November over Skype. Reporter Sam Carchidi contributed to this article.